5 "Belgians Can Do Too!" When the Korean War broke out in 1950, Belgium was experiencing a period of turmoil. Belgium had been occupied by the Nazis during the Second World War between 1940–4 and reconstruction was still very much in progress. Politically, the country was torn over the issue of the so-called Royal Question. With the centrist parties thus occupied, both Communist and right-wing Flemish nationalist parties enjoyed considerable support. The Prime Minister in office, when the UN declaration calling for soldiers to be sent to the aid of Korea was sent, was Joseph Pholien of the Christian Social Party who was politically opposed to the rise of communism abroad and wished to gain support from the United States. Both the Belgian and Luxembourgish governments decided to comply with the UN request to send troops to assist South Korea. Over 2,000 Belgians volunteered for service in B.U.N.C. Of these, initially only 700 were selected for training at Leopoldsburg. After training, volunteers received their characteristic brown berets. Soldiers from Luxembourg who were trained alongside the Belgians were organised into 1st Platoon, A Company of B.U.N.C. The Belgian-Luxembourg Corps sailed from Antwerp to Pusan and arrived on 31 January 1951. On arrival in Korea, some South Korean troops were made part of the Belgian contingent in order to bring the regiment up to correct battalion strength along the lines of the US "KATUSA" or Commonwealth "KATCOM" programme. In April 1951, the Belgians fought in one of the key battles of the Korean War – the Battle of the Imjin River. The First Battalion was relieved by a new battalion fresh from Belgium in August 1951 which stayed until 1955. At the Battle of the Imjin River in 1951, the Belgian battalion held a key pass alongside the British Gloucestershire Regiment. For actions at the Imjin, the Belgians received a US Presidential Citation. During the battle, Albert Crahay, commander of the unit, was wounded by a Chinese phosphorus shell and was evacuated to a hospital in Japan. B.U.N.C. continued to see action and went on to earn further battle honours at Haktang-Ni – one of the series of battles at Broken Arrow – in October 1951 when the Belgians took up position on an isolated hillside and suffered relentless Chinese attacks which they successfully repelled, killing over a hundred Chinese and losing only a handful of men themselves. The last main action fought by the Belgian contingent was at the Battle of Chatkol in April 1953. Belgian forces held a defensive arc position in the Iron Triangle for over 55 nights of Chinese assaults. After the cease-fire, it was seen as unnecessary to keep BUNC up to the strength it had during the war and it was reduced to some 200 men on 30 December 1954, but, like other UN contingents, it was viewed as necessary to maintain a presence in Korea during the uncertain peace following the negotiations at Panmunjom and the last members of the unit finally left Korea on 15 June 1955. September 28, 1950 – November 21, 1951 Albert Crahay First Commander of the Contingent; Battle of the Imjin River. Wounded by Phosphorus Grenade Retired with rank of Lieutenant General. He also commanded the Belgian army of occupation in Germany. November 21, 1951 – February 23, 1952 Norbert Cools Replaced for health reasons. February 23, 1952 – February 13, 1953 Georges Vivario Battle of Haktang-ni Became Commander of the Joint General Staff and retired with the rank of Lieutenant General. October 1, 1951 – September 30, 1951 Joseph "Jos" Wagener 1st Luxembourgish Detachment, Operations around the Han River, Battle of the Imjin River Later Lt. Col.
BELGIANS CAN DO TOO! was a slogan written across the windshield of Padre of the Unit's (Padre Vander Goten) Jeep during the battles around the "Iron Triangle." Seeing the exhaustion of the troops, the Padre copied the motto of the US 15th Infantry Regiment ("Can Do") alongside whom the Belgians were serving at the time to try to raise morale. The phrase was made famous in Belgium and is thought to summarise the spirit and courage of the Belgian contingent. 101 Belgian soldiers, 2 Luxembourgish soldiers and 9 South Korean soldiers attached to the Belgian contingent were killed during the war. 478 Belgians and 17 Luxembourgers were wounded in action and 5 Belgians are still posted as missing. 2 died in North Korean POW Camps. 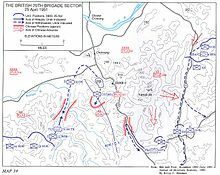 The British 29th Brigade Sector during the Battle of the Imjin River, 25 April 1951. The positions of the Belgian battalion are also marked at the bottom. B.U.N.C. was awarded two South Korean Presidential Unit Citations and one American Unit Citation. By order of General Van Fleet. The Belgian-Luxembourg Corps served at three key battles of the Korean War – the Battle of the Imjin River and Battle of Haktang-ni 1951, and the Battle of Chatkol 1953. Memorial to the Luxembourgish participation with a Patton tank at the National Museum of Military History, Diekirch. The 3rd Parachute Battalion maintains the traditions (including the flag and badge) of BUNC and is based in Tielen. The National Museum of Military History in Diekirch, Luxembourg has a permanent gallery and memorial on the participation of B.U.N.C in Korea. There is a small museum attached to the Barracks of the 3rd Parachute Battalion, Belgian Army, in Tielen, Belgium which focuses on the Belgian participation in the Korean War. In 2011, The Royal Museum of the Armed Forces and of Military History in Brussels, Belgium put on a temporary exhibition entitled Belgians Can Do Too! about B.U.N.C. in Korea. Twin Belgian battalion monuments exist in Brussels – on Avenue Jules César- and in South Korea -Dongducheon-si in Gyeonggi-do province. There is a small monument outside the Freedom Protection Museum, also in Dongducheon-si, South Korea. There is also a small monument outside SHAPE Headquarters in Mons, Belgium. Etienne Gailly, Bronze medal winner at the 1948 London Olympic Games served as Captain in BUNC alongside his brother Pierre. Pierre Francisse, 1948 London Olympic Games, track and 1960 Rome Olympic Games, Fencing (épée), was a Lieutenant in Korea. He was too severely wounded to continue his track event, and took up fencing for the Belgian Olympic team. Retired as a Colonel of the First Regiment Guides. Albert Guérisse was a notable member of the Belgian resistance during the Second World War. He created the Pat Line to help Allied Airmen escape capture in Nazi-Occupied Europe under the pseudonym Pat O'Leary. After serving in Korea he became the commander of the Belgian Medical Component with the rank of Major-General. Henri Moreau de Melen, Minister of Defence for the Christian Social Party (PSC-CVP) government who resigned his ministerial post and volunteered for service in Korea in 1950 with the rank of Major. Guy de Greef, a captain in B.U.N.C. and who served at the Battle of Chatkol in 1953 was the son of the Belgian Minister of Defense Eugène De Greef who held the post 1950–1954 after Moreau de Melen's resignation. Sgt. Albert Constant Belhomme, a Belgian national who emigrated to the U.S. and served in the US Army in Korea. He was captured by Chinese forces, but chose to stay in China rather than return to the west after the armistice, though he finally returned to live in Antwerp in 1966. ^ "Belgian Volunteer Corps Korea". belgian-volunteercorps-korea.be. Retrieved 4 November 2012. ^ "BUNC". hendrik.atspace.com. Archived from the original on 12 August 2013. Retrieved 4 November 2012. ^ "Citations, awards and Medal". militarytimes.com. Retrieved 4 November 2012. ^ "National Archives". www.koreanwar-educator.org. Retrieved 4 November 2012. ^ "HOME Webmaster Jan Dillen Korea veteraan". ^ "The Belgian Forces in the Korean War". Archived from the original on 2013-08-12. ^ "Korean War Educator: Topics - National Archives Records - RIP 103". ^ De Wit, Frans (2003). Belgians Can Do Too!. De Krijger. ISBN 9058680665. Retrieved 4 November 2012. ^ "Etienne Gailly". belgraveharriers.com. Archived from the original on 7 February 2012. Retrieved 4 November 2012. ^ "Albert Guerisse: Belgian war hero". nytimes.com. Retrieved 4 November 2012. Wikimedia Commons has media related to Belgium in the Korean War. (in English) (in Dutch) (in French) "Belgian-Volunteercorps-Korea.be". Retrieved 4 November 2011. "Belgiansandthekoreanwar.co.uk". Archived from the original on 16 May 2013. Retrieved 1 November 2012. "BUNC". hendrik.atspace.com. Archived from the original on 12 August 2013. Retrieved 4 November 2012. "'Good things come in small packages'". Archived from the original on 7 March 2016. Retrieved 4 November 2012. "The Brown Berets". Esprit de Corps. Archived from the original on 6 March 2016. Retrieved 4 November 2012. "anciens-combattants.lu" (in French). Retrieved 4 November 2012. "Museum" (in Dutch). Archived from the original on 10 November 2011. Retrieved 4 November 2011. Le Roy, David. "Het Belgische Korea-bataljon" (in Dutch). ethesis.net. Retrieved 4 November 2012.